Two Boys. One Summer. A Lifetime of Regret. As an adult, William looks back on his own loss of innocence and the callousness of youth. A mature remembrance of the unforeseen consequences of youthful indiscretion, as he tries to understand the dark forces that defined his best friend's character. As teenagers, Billy and David, along with their beloved dog Big Red, take a trip "going down Maine" for a summer vacation. There, in a strange and isolated upper Maine coastal village, Billy reflects on his friend's increasing fascination the the disturbing history and dark secrets of the local residents. Youthful choices, on this fateful trip, set in motion a series of irreversible events that change their friendship and forever alter their paths. Here among strangers, they learn the difference between those who choose a path through life and those who fight the path chosen for them. In 1876, across the South Dakota Territory, a man could make his way. For a woman, skirting tradition, the harsh environment was rife with opportunity. It was a time of free land for anyone hardy enough to homestead. And, a lawless time of gold rush, conflicts with the Sioux Nation, dime novels and raw emotion. Using mischief woven with historical fact, it is the story of when Bob Slye, a bandit by profession, met the wildly eccentric, Sally Mae Boudine, recently a sharp shooter in Buffalo Bill Cody's Wild West Show - and the possibilities were endlessly dangerous. .....From the musings of Mark Slade, that explore life's foibles and fears, joys and heartbreaks. Like a capsule of time in verse, accompanied by humorous illustrations by the author interpreting his words. 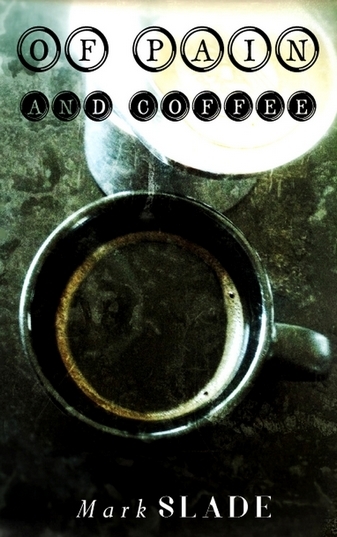 OF PAIN AND COFFEE, takes the reader on a journey through the emotions, conundrums and paradoxes that surround our lives. Using simple line drawings and verse, he encourages the reader to see ourselves and the world that surrounds us with both distance and intimacy. A tentative moment, a fleeting expression, a furtive glance - they can each provide a momentary glimpse into someone's life. In a single instant. a history is revealed for those who choose to see. There, within the lines and creases, like riverbeds and gullies, are the hopes, dreams and disillusions of a path traveled and choice made. SOMEONE'S STORY takes the reader on an emotional journey through those brief moments when we can feel another's life. The author's own photography creates a subtle melding of the pictorial and verse.